Book Update: I finished “The Rent Collector” by Camren Wright. It was good! I would recommend it if you like reading especially about other parts of the world. My other projects were on hold today due to mouse poop. Yep. The mice found some grass seed and left mouse poop all over the shoe area in our garage. So, I got that bleached out. Found more mouse poop and a nest in another shoe. Cleaned the area and threw the shoe in the trash. Found more mouse poop behind some wood in the garage with acorns. Then, found more mouse poop on another shelf. Then, finally.. guess what? More mouse poop! But this time there was a half decayed mouse next to it in the trap. You have to have to variety in life, ya know? After that I let myself take a break, hosed out the stairs and discovered that the garage slopes to the right. So, all the water drained opposite the way I sprayed and into the 30+ computers that my husband has sitting in the garage. Carried them out to the driveway. Dried them off and carried them all back into the garage. Now remember, these are computers from like the late 90’s when everything weighed 80 pounds or more. I did an easy workout video tonight to compensate. No worries. If I need to borrow a sledgehammer, you’ll know why. Recipe Update: Speaking of smashing things…. 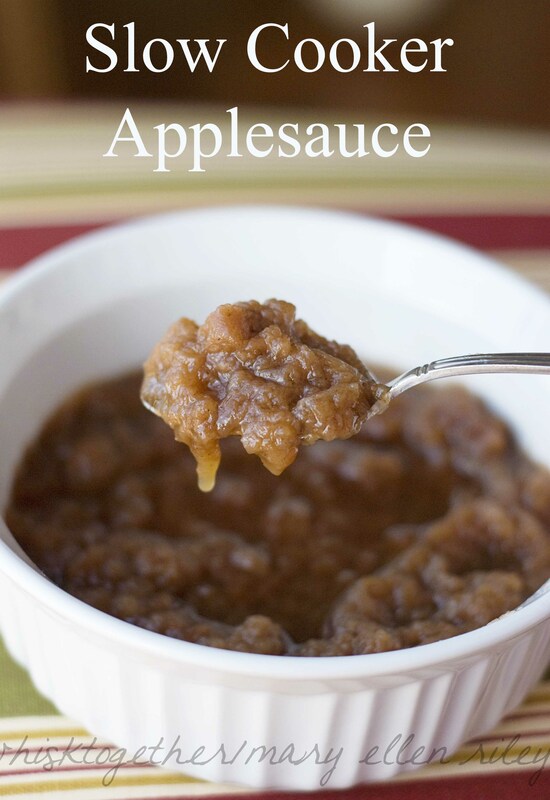 I made some super yummy applesauce! After tweaking the recipe a few times, I have it the way we like it and of course the least amount of sugar while still tasting great. After working on the recipe, I remembered Alton Brown’s 10 minute applesauce recipe that I tried a few years ago, but I think this one tastes better. Our Community Helpings Co-op sells apples by the bushel and I got one for $21. Not too shabby at 50 cents per pound. I really like Golden Delicious here because they break down so easily and smoothly while lending so much sweetness that sugar is not needed. Other good apples for sauce are: braeburn, cortland, crispin, McIntosh , fuji, gravenstein, liberty, and rome. This makes a great simple side dish for dinner, or pour on pork tenderloin, or serve with pork chops. I love using it on top of my oatmeal in the morning. What to do with all of those apple peels? Throw them in to make apple butter! Just be sure to add a little lemon juice or citric acid to the peels if not making the apple butter at the same time. 1. Pour just enough water or apple juice into the slow cooker to just barely cover the bottom. 2. Add apples. This is just an estimated number of apples. 3 pounds will work and 5 pounds will work as well. The amount depends on the size of your slow cooker. 3. Drizzle lemon juice on slices to avoid browning. After all the apples are in the slow cooker, sprinkle a light dusting of ground cinnamon over the apples. 5. Most apples like Golden Delicious will require no other processing. They will mash into an applesauce consistency with a spatula. Simply refrigerate, freeze or can! If canning, process in a water bath for 15 minutes or 20 minutes for high altitudes. If freezing, store in a hard plastic freezer container, glass freezer safe container, or freezer storage bag.